Having control over code is an important part of a software application development process. A lot of programmers need efficient code editing and debugging tools to work with accuracy and speed. This may be the reason as to why an IDE (Integrated development environment) was conceptualized. An IDE has a source code editor, a code debugger, code completion feature, build automation tool, compiler and more all in one single software application. Modern IDEs have a graphical user interface with a single program which offers several features, such as authoring, compiling, deploying and debugging software code. Some IDEs are dedicated to a specific, single programming language while there are a few more that support multiple languages. Eclipse, NetBeans, CodeEnvy, Xojo, and Xcode are some examples of modern IDEs. Here, we are focusing only upon IDEs for Node.js applications. We are aware that Node.js has successfully captured the mainstream technology market with large-scale companies like IBM, Yahoo!, Walmart, SAP, and others using it. These days, Node.js application development is gaining momentum and it is used by a vast community of developers, technology enthusiasts, and programmers. In our last post of Node.js I have highlighted some of the best web hosting platforms for Node.js application, today I have listed down the names of major IDEs for Node.js development. Most of them support multiple platforms like OSX, LINUX, and Windows. I have also listed down some names of popular text editors since they perform much of the required job. Codenvy offers a variety of versions for different price variations. 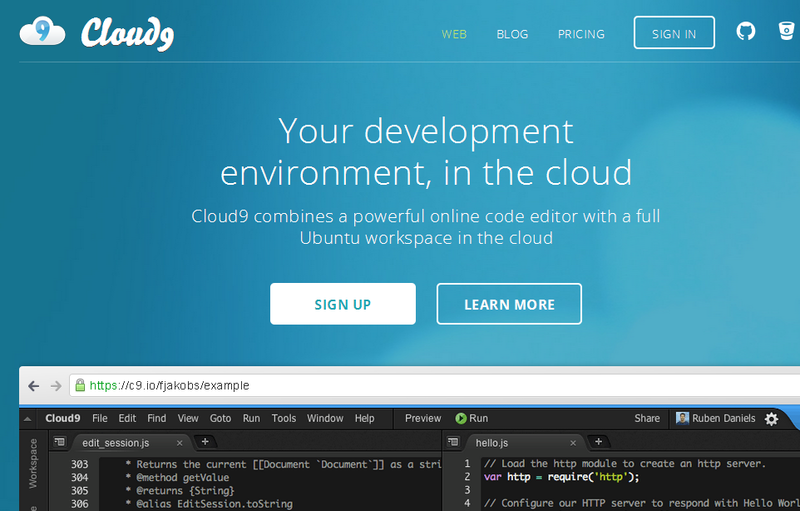 It also provides cloud workspaces to write, run and debug for app developers and web designers. The availability of cloud workspaces for dev teams makes developing code with portable docker runtimes possible. The dev mode comes in handy while configuring the runtime, injecting root-privileged terminal, SSH access, language services followed with a debugger. If you are a Node.js developer, then there is no lack of necessary tools to get your job done. There are a lot of testing tools, frameworks, and IDEs available for Node.js application development. A lot of application developers are currently working to develop an array of useful applications using Node.js framework. One can easily develop real-time web applications, such as instant messaging or chat applications using Node.js. KeystoneJS is an example of a content management system (CMS) built using Node.js. It is used for building database-driven, modern websites as well as applications and application programming interfaces (APIs). Another is Ghost, a popular blogging platform. Moreover, you can also build servers, games, websites, content management systems and a lot more using this powerful technology. I am sure you must have found this list helpful and will definitely find the perfect Node.js IDE from this list. You can share your feedback on this topic by writing your comments in the comments section below. Also, if you feel that you’d like to delve deeper into learning Node.js and become a certified Node.js developer, you can try out this course ‘Elite NodeJS Course – Become Certified NodeJS Developer‘. From the fundamentals to the advanced topics such as MongoDB setup, Node.js Express and much more! Atom is not an IDE. Why is it on the list? Why didn’t you mention Visual Studio 2015 (inculding the free Community Edition) with NodeJS Tools (also free)? Also Intellij IDEA and WebStorm are the same (just different license and name, but the same functionality). How about Visual Studio (not Code)? Would that be suitable also? Webstorm isn’t free. It just has a free trial.